Part of Natural Vitality’s plant-sourced Foodiceuticals line, purified-water extraction of soluble plant-derived minerals. Plant-Sourced Minerals are a purified-water extraction of soluble plant-derived minerals. The minerals are sourced from a prehistoric plant deposit called Senonian Vegetate. This vegetate is mineral-rich organic soil derived from plants and naturally protected from mineral depletion. 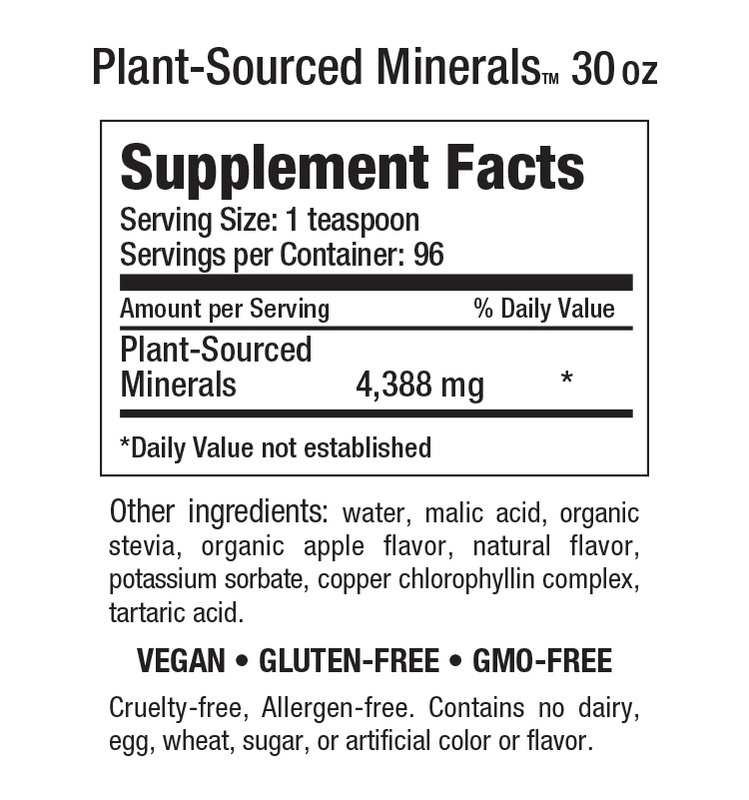 Plant-Sourced Minerals are minimally processed and include naturally occurring polysaccharides, lipids and other valuable nutritional cofactors. PSM delivers a complex of more than 70 plant-based, small-particle, bioavailable life-sustaining trace minerals in an easily digested and assimilated form. Both Plant-Sourced Mineralsliquid and caps are measured by weight. They are a highly bioavailable, small-particle complex of over 70 different minerals and other valuable nutritional cofactors. Our caps and PSM liquid weigh differently but are comparable in mineral complex content. 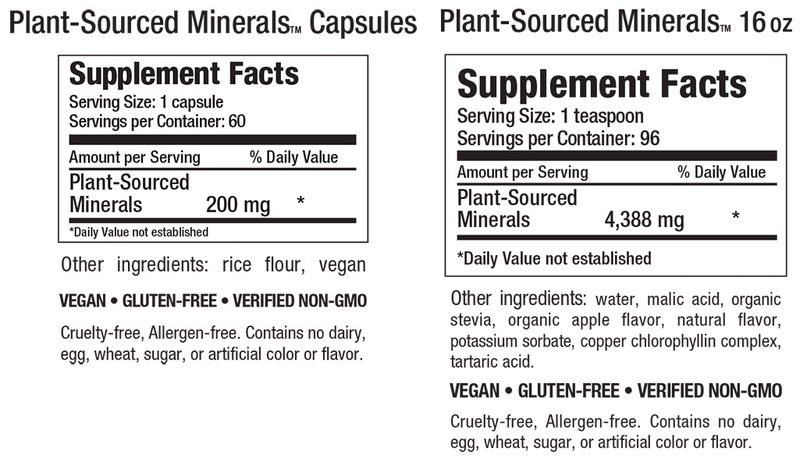 Is Your Body Missing Minerals? According to medical doctor and agricultural expert Dr. Arden Andersen, the nutrient content of foods today compared to half a century ago ranges from 15 to 75 percent less. This isn’t good news, considering that our bodies depend upon the things we eat. The average human body contains something on the order of four trillion cells. Between 60 and 70 percent of those cells should replace themselves every six months. That means that about 15 billion cells in your body are replacing themselves every day. Each of those cells has a nucleus in it that contains your DNA, and each strand of DNA requires at least 45 separate minerals to replicate itself properly. Your body uses nutrients in the food you eat to rebuild itself constantly. If you are not supplying your body with key minerals it needs, its biological processes will slow down, which can contribute to low energy and aging. We support organic food and organic farming and we are founding sponsors of both the Bionutrient Food Association (www.bionutrient.org) and Remineralize the Earth (www.remineralize.org), which are actively working to restore the nutrient levels of our soils and assisting growers to produce fruits and vegetables high in nutrients. While the agricultural system is evolving, we offer plant-based nutrients to meet the stresses of our world and the needs of your body today.